Oh, the fit and the flare. This silhouette, probably more than any other, has dominated fashion for several years. Having spent so much time researching and sewing historical costumes, I’ve realized that every decade has an easily recognizable silhouette. Historically, women’s fashion has represented something about the ideals of its time, and not just beauty ideals but social, political, or artistic. In the 1830s it was… uh, whatever the hell this is…? Anyway, fifty years from now, how will we look back and define early 2000s style? My vote is the fit and flare. This style has been lauded as universally flattering and classically feminine. There’s something appealing about the contrast between slim and full shapes. But I think it’s the vintage revival movement that has played a major role in the F&F popularity. And the style is not restricted to dresses. Sometimes you see it reversed with the oversized, loose shirt paired with skinny jeans or leggings. It’s certainly a style I keep coming back to over and over again. 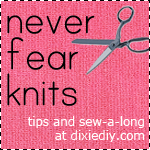 The fit and flare is a relatively easy shape to sew. If you can get the bodice to fit then you don’t have to worry about the hips because the skirt is so full. 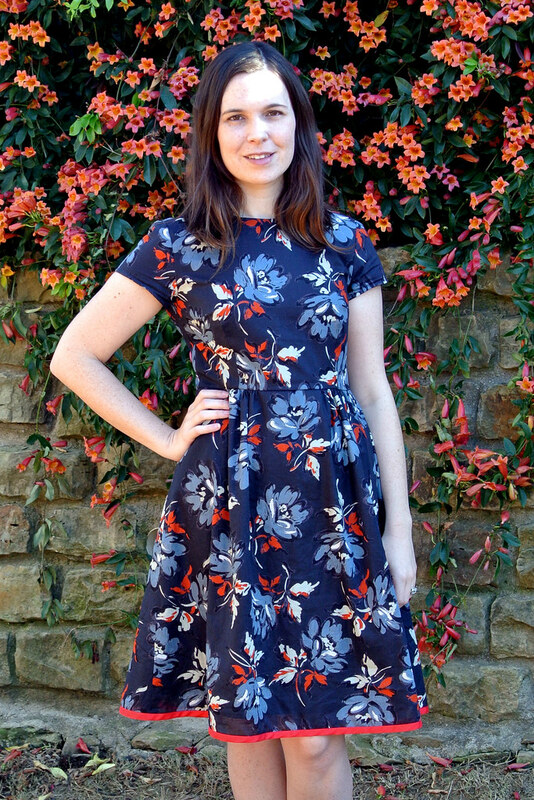 The simple shape is perfect to showcase a fun fabric (Dolly Clackett comes to mind) and there’s nothing like wearing a cute dress to make you feel pretty. It began with Simplicity 1419 (which I used for this dress) but I made several changes. The floral cotton lawn was too sheer on its own so I fully lined it in navy voile. Each fabric came from different – now defunct – local fabric stores. Double sad. Rather than pleating the skirt, I gathered it and spaced the gathers out so there are four “gathered groups” collected under the bodice darts. I hemmed the lining normally but I bound the hem of the outer fabric in bias tape. I had justenough of this red tape left which closely matched the red in the flowers. I had a navy colored invisible zipper but it was too short so instead of driving five minutes to the store and buying a new zipper like a normal person, I made a keyhole-esque part at the top center back and added a hook and eye to keep it closed. Lastly, I raised the waistline by an inch (something I also did on my last version). This wasn’t a fit issue, purely aesthetic. For some reason I like the look of the ever-so-slightly raised waist on a dress like this. Oh, and no pockets. ‘Cause I’m laaaaazzzzyyyyyy. So, do you agree with my thoughts on the fit and flare? Is there another style right now that you think deserves the top spot for “2k10s most popular silhouette”? Do you wear/sew F&F dresses?